(Nanowerk News) Nanotubes have attracted a lot of attention since their discovery because of their outstanding electronic and mechanical properties. However, the complex methods and extreme conditions typically needed for their synthesis makes accurately controlling their size, shape and atomic constituents — and hence their physical properties — difficult and costly. Kazuya Otsubo and Hiroshi Kitagawa from Kyoto and Kyushu universities in Japan and colleagues have now shown that it is possible to use a controllable bottom-up approach to construct nanotubes using metal-organic building blocks ("Bottom-up realization of a porous metal–organic nanotubular assembly"). The researchers created their metal-organic nanotubes through the simple polymerization of a square metal-organic framework (see image). The fundamental building block is a complex of platinum atoms and nitrate anions, connected by organic ligands (ethylenediamine and 4,4'-bipyridine), to form a square-shaped motif with a side length of 2 nm. Metal-organic nanotubes made out of platinum (orange), iodine (purple), carbon (gray) and nitrogen (blue) can be grown by polymerization of a square metal-organic frame. 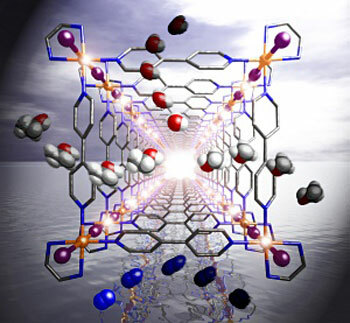 To create tubular nanostructures out of these building blocks, the researchers used an oxidative reaction with iodine to bridge the square platinum complexes with iodide ions, resulting in an infinite four-legged ladder lattice. The nanotube thus constructed is porous with a sub-nanometer window size. According to the researchers, the molecular composition of the nanotube allows for the selective adsorption of water and alcohol vapors and the exclusion of nitrogen and carbon dioxide. The most important feature of these nanostructures, however, is their designability and tunability. The researchers conjecture that the sorption properties could be controlled accurately using different oxidation methods and chemical ligand modifications. "We believe that the key factors for controlling sorption properties are the pore size and hydrophobic or hydrophilic character, which are mainly dominated by the rung ligand," says Otsubo. Another feature of the nanotubes is their semiconductor-like characteristics. As demonstrated by the researchers in their study, the electronic properties can be sensitively controlled by exchanging the bridging iodine ion with bromine or chlorine. "Exchanging the metal ions may also enable us to control the electronic states of these nanotubes," says Kitagawa. The possibility of sensitive control of the size, shape and physical properties of metal-organic nanotubes constructed by this bottom-up approach could greatly facilitate the realization of nanotube-based devices such as chemical sensors.